Use our many workshops, outdoor games and activities, and crafts to explore your neighbourhood with little ones! (Open thematic poster-My neighbourhood) Print, laminate, and decorate the walls of your daycare with all kinds of posters. This special tool was created in response to a special request received. (Open telephone-black and white) Print for each child. What do you see on your way to the daycare? 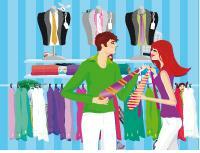 Can you name a store located in your neighbourhood? Do you know the name of your street? What color is your house? What color are your neighbour's houses? 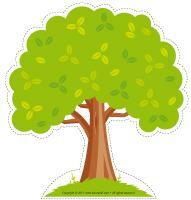 Are there many trees in your neighbourhood? Do you know what kind? Who works in your neighbourhood? What are their jobs? Educ-chat is a game which contains a variety of illustrations representing subjects, verbs, and objects children can use to make complete sentences and build their vocabulary. (Open educ-chat-My neighbourhood) Print, laminate, and cut out the cards. Make three piles (subjects, verbs, objects). Ask a child to pick three cards, one from each pile, and read the sentence. The sentences will sometimes be silly, but you are sure to have fun! You may also choose to place the cards yourself and ask a child to read the sentence. Hang a variety of items which represent the stores and businesses found in your neighbourhood from the ceiling to attract children's attention. They will question you about the theme you will be exploring. 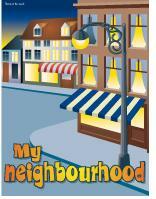 (Open educa-decorate-My neighbourhood) Print, cut out, and laminate. Use the illustrations to decorate your walls and hang a few from the ceiling. (Open garland-My neighbourhood) Print. Let children decorate the garland. Cut it out and hang it within the daycare or near your daycare entrance. (Open picture game-My neighbourhood) Use the pictures to decorate your daycare or to spark a conversation with your group. Print, laminate, and store the pictures in a Ziploc bag or in your thematic bin. 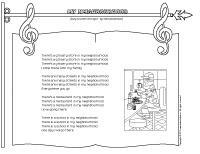 (Open activity sheets-My neighbourhood) Print and follow instructions. (Open writing activities-N like neighbourhood) Print for each child or laminate for use with a dry-erase marker. Blocks of all kinds children can use to build their house or their neighbour's house. Figurines of all kinds to represent each child's family. Figurines representing construction workers... they build the homes found in our neighbourhoods. Ask parents to provide pictures of family members. Glue a Popsicle stick behind each picture to create personalized figurines. Collective mural of children's homes: large piece of white paper, people cut out of catalogues, colourful cardboard and paper, etc. Recycled materials which can be used to make three-dimensional houses. Ask parents to help! 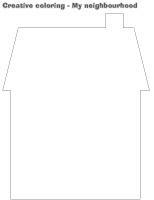 Pre-cut paper or cardboard shapes children can use to create houses. Paint samples to cut out. Old decorating magazines. Children can cut out their favourite rooms. A square and a triangle cut out of Mac-Tac. Fill the shapes with colourful tissue paper to create a stained-glass house. 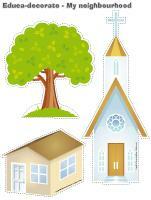 Coloring pages representing various types of homes. Stencils representing different types of houses and homes. Decorate your area with pictures of people who are different ages. Create a home including several rooms: kitchen, bedroom, living room, bathroom, etc. Add accessories to each area. For example, add a mattress, a small table, and books in the bedroom, a big chair, a television, and a blanket in the living room, and empty shampoo bottles, toothbrushes, and toilet paper in the bathroom, etc. Memory game involving illustrations of common household items. Word flashcards representing objects found in the house. Books about houses, the Three little pigs story, or books about princesses living in castles, etc. A picture book which shows different types of houses. 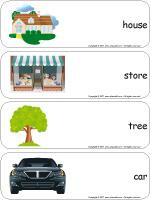 Word flashcards representing objects which can be found in a house. A walk in your neighbourhood to observe different types of houses. Build a house or an entire neighbourhood with boxes and blankets. Container filled with dirt: create your own little garden in the yard. Container filled with water: let children pretend they are cleaning the daycare (the house). Practice identifying various sounds which can be heard in a house (purchase a game or create your own): doorbell, telephone, washing machine, etc. Box containing a variety of objects found in a home: toothbrushes, pencil, comb, etc. Blindfold children and let them touch the objects to try to identify them. Make a gingerbread house or use rectangular-shaped cookies and icing to create a house. Use the flashcards to spark a conversation with your group, in your reading and writing corner, or to identify your thematic bins. 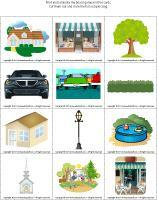 (Open word flashcards-My neighbourhood) (Open giant word flashcards-My neighbourhood) house, store, tree, car, parking lot, hedge, shed, street lamp, swimming pool, church, playground, restaurant. 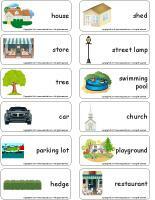 Print and laminate the word flashcards. Children take turns picking a word and presenting it to the group. Discuss as a group. Ask questions to keep children talking as long as possible. 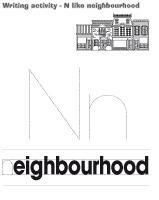 (Open scene-My neighbourhood) Print, laminate, and cut out. Children use the pieces to create various scenes. (Open picture clue story-My home) Print. Sit in a circle with your group. Begin reading the story. Whenever you reach an illustration, pause and point to it. Children must guess the missing word. (Open felt board-My neighbourhood) Print the various pieces and glue them on felt pieces. Glue four pieces of black felt on a large piece of cardboard. The felt shapes will stick to the felt board very well. Children will enjoy creating stories with the felt board. (Open game-This is my spot-My neighbourhood) Print two copies of each illustration. Deposit one illustration on the table and cover it with Mac-Tac. Place the other copy in a bag. Children take turns picking an illustration to determine their spot at the table for the day. You can also use them to determine naptime spots or their place in the task train. Move about the daycare single file. Pretend you are visiting your neighbourhood and present various obstacles: a stop sign, a yellow light, someone crossing the street, a bus, a sign indicating that you must turn right, etc. Ask children what you must do at each obstacle. Take a walk around the neighbourhood with the babies in your group and name the places and things you encounter. Display several pictures which represent the stores, businesses, houses, signs, etc. which can be found in your neighbourhood. 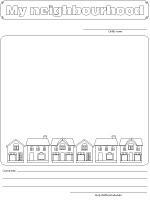 You can use the pictures to create a miniature neighbourhood. (Open lacing-My neighbourhood) Print, laminate, and punch holes around the contour of each shape. Children can use string or shoelaces to lace the shapes. Sit in a circle with your group. Begin the game by saying, "I am going to the market to buy..." Name an object. The child sitting next to you must repeat the sentence, repeat the item you named, and add one of his own and so on. Arrange chairs in a row, one behind the other. Invite children to take a seat inside the bus. Let children take turns being the driver. You may add accessories such as backpacks, lunchboxes, etc. (Open traffic lights and signs) With your group, use chalk to draw a giant city on the pavement. Depending on the size of the space available, you can add streets, a grocery store, a bank, a playground, a daycare, a school, etc. Add traffic signs. Children will enjoy riding around the city on tricycles or driving little cars. When you display the green traffic light and say "green light", children can ride around as quickly as they wish. When you show them the yellow traffic light and say "yellow light", they must slow down. Finally, when you raise the red traffic light and say "red light", children must stop where they are and wait for the light to change again. Change the lights several times, just for fun! Variation: When you say "red", children must contract their muscles. They can relax when you say "yellow" whereas when you say "green", they must take deep breaths. Repeat several times. Use psychomotor material to create a neighbourhood complete with streets, bridges, etc. Add small houses throughout the course. Children can walk around the neighbourhood. You can add pictures and illustrations too. Visit your local grocery store. Invite parents to join you. Identify the fruit and vegetables section, the cheese section, the baked goods, etc. If you ask your grocer, you may even be able to visit the meat department or the bakery. Children love cabins. Drape old sheets over your garden furniture, tables, chairs, etc. to create tents or cabins. Add objects which can be found in the woods. Let children play in the cabins. You can even let them eat their snack in them! Take a walk with your group. 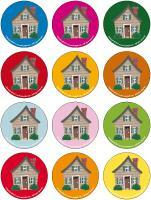 Show children different types of houses: single family, apartment buildings, townhouses, etc. Ask children to show you a house which looks like their house. When you return to the daycare, invite children to draw one of the houses you saw during your walk. Organize a neighbourhood photo contest. Ask parents to take pictures of the places and things found in your neighbourhood with their children. Display the pictures on your daycare walls throughout the theme and have parents vote for their favourite picture. 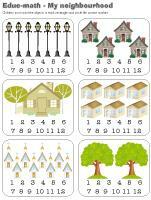 (Open educ-math-My neighbourhood) Print and laminate for durable, eco-friendly use. Children must count the objects in each rectangle and circle the corresponding number. 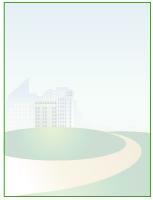 (Open educa-duo-My neighbourhood) Print and laminate for durable, eco-friendly use. Children must draw a line between the items which go together using a dry-erase marker. (Open educ-trace-My neighbourhood) Print for each child. 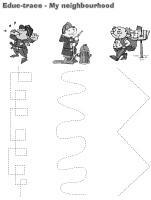 Children must trace each line using the colour of their choice and then colour the character with the same colour. 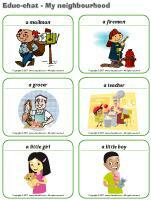 (Open educ-differences-My neighbourhood) Print and laminate for durable, eco-friendly use. Children must identify the differences between the two illustrations and circle them with a dry-erase marker. (Open magnifying glass game-My neighbourhood) Print and laminate the cards and board game. Cut them out and store them in a Ziploc bag or box. Children pick a card and search for the item on the board game using a magnifying glass. When they find the item, they deposit the card in the correct square on the board game. (Open hunt and seek-Store) Print and laminate. Children must pick a card and search for the item in the scene. Have fun sorting objects by shape, size, color, material, etc. Deposit several boxes throughout the daycare and stick pictures on each one to help children associate the objects to the correct category. (Open hunt and seek-My home) Print and laminate. Children must pick a card and search for the item in the scene. (Open association game-My home) Print and laminate. Using Velcro, children must stick each item in the correct room. (Open magnifying glass game-My home) Print and laminate the cards and board game. Cut them out and store them in a Ziploc bag or box. Children pick a card and search for the item on the board game using a magnifying glass. When they find the item, they deposit the card in the correct square on the board game. 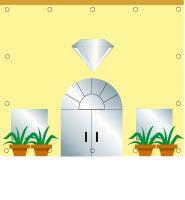 (Game-House under construction) Print, laminate, and cut out each piece of the house. Children assemble the pieces to create a house. 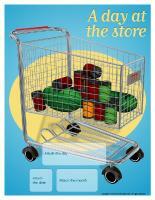 (Open perpetual calendar-A day at the store) For the day, your daycare becomes a mall. Greet children with an information booth and direct them to the various boutiques. If you have a microphone, use it to make this greeting even more special. Your reading corner can become a bookstore filled with reading treasures, your construction area can become a hardware store or a garage (or both if you have enough room), your role play area can become a grocery store or a clothing store, etc. Think of all the stores which can be found at a mall and use them as inspiration when you are planning your games and activities for this special day. You can transform your backyard so it looks like a small circus, like the ones which often visit mall parking lots. Serve lunch and snacks in your very own food court. Offer children a menu so they can "choose" their meal. Children will love this! It's also a great chance to talk about food from other countries since food courts often offer many different types of food. Use sheets, blankets, and boxes to build houses. Provide plastic containers, empty cardboard boxes, etc. throughout the theme. Your local grocer will be happy to give you a few boxes. Let children play in the boxes as they please. They will spend hours creating small houses with several different rooms. 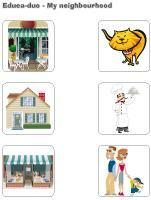 (Open story and memory game-My home) Print, cut out, and laminate the illustrations. Place the cards face down on the floor. Children pick three cards and invent a story in relation to the illustrations. 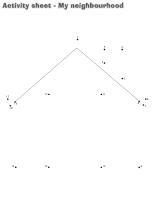 Variation: Print the illustrations twice and use as a memory game. Glue the illustrations to the tops of frozen juice cans to make them stronger. 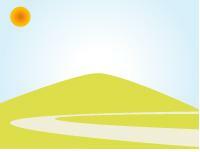 Encourage children to collect rocks when you are taking a walk. Afterwards, explore different ways you can transform them and turn them into precious stones. You can paint the rocks and add glitter to the paint. When they are dry, apply varnish (or white glue) to make them even shinier! Use different types of paint. Open your own lemonade stand. Use a juice extractor and a variety of fruits and vegetables to create several different kinds of juice. Pretend you are at the ice cream parlour and let children create their own yummy treats using the following: ice cream, syrup, caramel or chocolate sauce, candy pieces, and cherries. Purchase Social Tea cookies and icing. Show children how to assemble them to create little houses. When they are done, they can completely cover the houses with icing and decorate them with candy pieces. (Open puppets-My neighbourhood) Print the various models on heavy paper. Have children cut them out and decorate them with a variety of arts & crafts materials. Attach a Popsicle stick behind the models and use them as puppets. (Open map of my neighbourhood) Print the color or black and white version and have children complete their map. They can add streets, people, etc. (Open stencils-My neighbourhood) Print and cut out the various stencils. Children can use them to trace or paint items related to the theme. Clean empty milk cartons (1 litre). Have children decorate them with whatever materials you have on hand. Cut an opening on one side to represent a garage door. Children will enjoy parking toy cars in their garage. Give each child three paper plates. Have them paint or color one plate red, another one yellow, and one green. When they are done, children can glue the plates on a piece of black construction paper to represent a traffic light. Show them the correct order (green, yellow, red). Each child decorates a brown paper lunch bag so it looks like a house. (Open craft-My house) Print, cut out, and glue the pieces on the bag. Children can drop a small treat or gift in the bag, fold the top down, and add a folded piece of construction paper on top to represent the roof. You can cut the bottom of the roof with pattern edged scissors if you wish. Completely cover a milk carton with brown construction paper. Add a wooden roof by gluing Popsicle sticks on the top. Provide a wide range of beads and other materials such as pompoms and colourful thread children can use to create their own jewellery. Fruits and vegetables which would normally go to waste make excellent homemade stamps! You may also use flowers. Nuts, bolts, and metal wire can be used by children to make great sculptures. They represent hardware stores beautifully! Give each child a white adhesive floor tile. Let them paint the design of their choice on their tile. Display the tiles on the wall. Use a variety of recycled materials, a large piece of cardboard, and your imagination to create your dream mall...if you work together as a group, you are sure to have many different types of stores. (Open creative coloring-My neighbourhood) Print for each child. Invite children to complete the picture. (Open scrapbook-My neighbourhood) Print this page for each child. Let children complete the page and then add it to their scrapbook. If you do not have a scrapbook, visit the Scrapbook section in the educatall club. 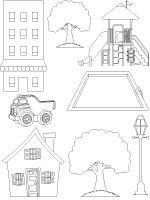 (Open coloring pages theme-My neighbourhood) Print for each child.